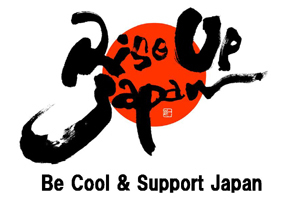 It’s monsoon season in Japan where the humidity level hovers around 90%, forcing salarymen to loosen their neckties on the way to the office. 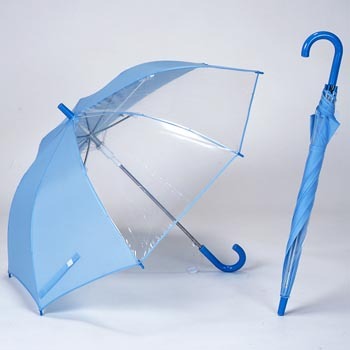 What better umbrella to own than one that fits into your purse! 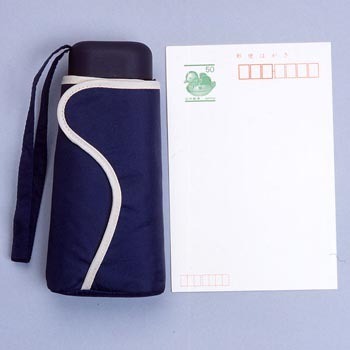 I’ve bought a number of these in Tokyo for anywhere between $10 to $20, oftentimes when a sudden rainstorm leaves me stranded in the middle of town. They’re hinged in two different places and fold up pretty easily…with a little bit of encouragement. Here’s your chance to snag that boy you’ve been eyeing in biology class. Class is dismissed and everyone heads out. But what’s this? A thunder storm! Before he makes a run for it, seductively tap him on the shoulder and offer a spot under your umbrella for two. With a wingspam of over 3 feet, it’s the perfect facilitator for intimate conversations and shoulder-to-shoulder rubbing action. Ooh la la! So now that you and that boy from biology class have tied the knot and had babies, here’s a cool invention you can give your kid to make sure he stays out of trouble. From fast-moving cars to school bullies, your kid can now spot oncoming trouble and still stay dry, not to mention chic. “101 Useless Japanese Inventions” anyone? Don’t laugh, this product is real. Selling for $20, it’s attached to a leash and hovers several inches above your favorite pooch through rain, sleet or snow. 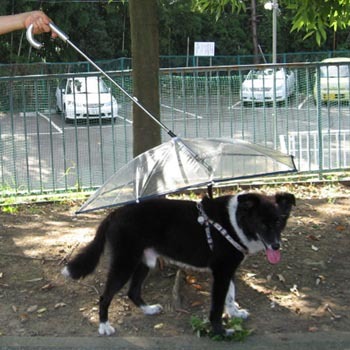 Unfortunately, the umbrella handle doesn’t allow for slack during your dog’s sudden urges to chase after that squirrel. You’ll just have to run to keep up. 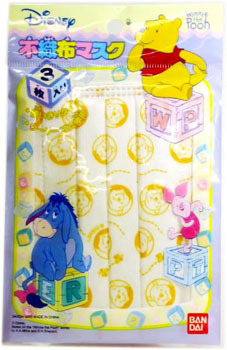 Here’s another product that’ll bring a smile to your nightly ritual. It’s odd-tasting toothpaste byBreath Palette ! It’s a fruit basket of 18 flavors like Tropical Pineapple, California Orange, Grapefruit, Strawberry, White Peach and Fuji Apple. There’s also some really questionable ones like Lavender, Bitter Chocolate and Cola. Whoa~ Cola?! I thought toothpaste was for cleaning my teeth, not corroding it. (O.o) Hmm, I should give it a try. Each taste of the rainbow comes in a cute little tube, which is especially handy for weekend getaways and stinky-breath emergencies. Pack it in your purse and you’re good to go. Vanilla + Cola = Ice Cream Float ? Monkey Banana + Pumpkin Pudding = Banana Pudding ?? Cinnamon +Fuji Apple = Apple Turnover ??? The paste contains teeth-cleaning micro-beads and Xylitol, Japan’s favorite sugar substitute. It not only contains less calories, it prevents plaque buildup, too. Stay away from me, I just ate five cloves of GARLIC! I love garlic grilled over an open flame, slathered with salt and melted butter. The aroma alone puts a big grin on my face, though it seems to have a reverse effect on the people around me. Their eyebrows furrow as they pinch their nose shut when I try talking to them. Is my breath really that bad? The mouth wash contains Nata beans, lemons, tea leaves and Japanese honeysuckle. I first thought Nata beans were related to nata de coco — that cube jelly found in some Japanese drinks — but no, it’s an actual bean native to China and Africa. And it can grow as long as 2 feet! It’s packed with calcium, magnesium and other minerals good for healthy teeth. And just to make the rinse super tasty, it has xylitol, a popular sugar substitute in Japan that also helps prevents cavities. While I was in Japan last month — the peak of swine flu pandemonium — my American friend asked me to buy a pack of disposable face masks. “They’re cool! They’re like ninja masks!” he wrote in his email, requesting I buy at least a dozen so that he could parade around with it at night. Very strange. Any other American would freak out if they saw someone wearing a mask. 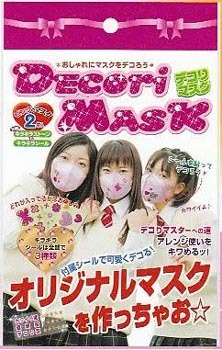 Bird flu, swine flu, cooties — having a mask on equates to being diseased. 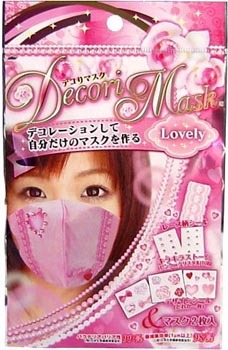 On the other hand, wearing a mask in Japan means you’re taking the proper precautions not to catch anything. There’s so many other types: masks that won’t fog up glasses, masks for small adult faces, masks with menthol filters, and my particular favorite, masks that allow for room around the mouth to breathe. They can otherwise be very uncomfortable to wear. And if you find yourself constantly taking it off to get some fresh air then you’re defeating the purpose of wearing one. That is, unless your only reason for having one is to be a ninja. Woohoo~!